Baby’s first bath is a special time. When gathering all your essential items, don’t forget the camera to capture this special moment. Your baby may cry, wiggle or pee. Anything can happen. 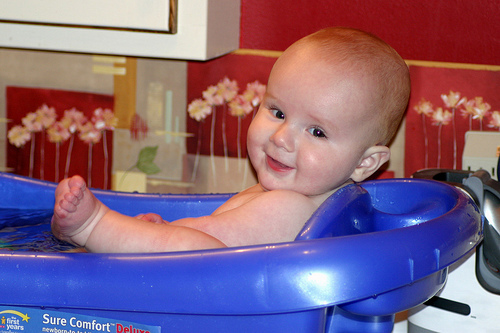 The kitchen sink or a baby bath tub is the ideal place for baby’s first bath. Since baby can’t sit up yet, these smaller environments are better than the bath tub. How Often Does Baby Need To Be Bathed? You’ll want your little one to be fresh and clean, but that doesn’t mean you need to bathe baby every day. Two to three times a week is more than enough for a full bath. You’ll want to wash your baby’s face, neck, hands and bottom daily. Usually, water is all you’ll need. Washing hair only needs to happen once or twice a week. If you bathe baby too often, you’ll find that dry skin problems may occur.